Miscellaneous articles, esp. the equipment needed for a particular activity. Trappings associated with a particular institution or activity that are regarded as superfluous. Don’t you love the word ‘paraphernalia’? MMMmmmm not so sure about definition # 2 above though…..all my knitting paraphernalia is important and certainly not superfluous! Like any interest, hobby, sport or craft there are usually some essential bits and pieces that are required. For knitting you have your basics but you can keep adding to the list as ideas jump into your head and you discover how lots of things become an important part of your knitting ‘tools’. I have made a list but I’m sure there are lots of things I haven’t included. I’d love to know what you consider are your essential knitting/crocheting bits and pieces. I’ll start with the most obvious…. Knitting Needles – These come in all sizes and are made of different types of material, eg metal/aluminium, plastic/acrylic, wood/bamboo. They also come in the traditional single pointed knitting needles, double-pointed needles, circular needles and cable stitch needles. Single pointed needles – Straight single pointed needles are generally used for flat knitting — knitting on the right side, and then turning and knitting on the wrong side. Straight needles come in many standard lengths. The larger your project, the longer the needle you’ll need. I find 25cm – 30cm the best to use as 35cm needles become a bit uwieldly to manipulate..
Circular needles – A circular needle is simply a pair of straight knitting needle tips joined by a flexible cable. You can use a circular needle to knit in the round — knitting in a continuous, spiral-like fashion without turning your work. This technique creates a seamless tube large enough for a sweater body or small enough for a neckband. You also can use a circular needle as you would straight needles, to work back and forth. This way, you can never drop a needle as it’s attached. Very handy when knitting on public transport. When you buy a circular needle, check to make sure the spot where the needle tip meets the cable (called the join) is smooth to prevent stitches from snagging. Several manufacturers now make circular needles with interchangeable needle tips and various cable lengths. These are useful for a wide variety of projects and make it very easy to swap needles when you’re attempting to find the right gauge with your chosen yarn. Double pointed needles – Double-pointed needles (aka dpns) have a point at each end and are sold in sets of four or five needles. They work the same way as a circular needle — in rounds. You use them to make small tubes when there are too few stitches to stretch around the circumference of a circular needle — for such things as sleeve cuffs, tops of hats, socks, mittens, and so on. I always use five dpns when knitting my socks as this is how I was taught. Cable needles – Cable needles are short, straight or slightly curved needles that are used to temporarily hold stitches in order to form the cable. To make a cable, stitches are worked in a different order than normal, making the twist within the fabric that we call a cable. (Knitting Needles information sourced from http://www.dummies.com/how-to/content/looking-at-different-kinds-of-knitting-needles.html. Knitting Yarns – There’s a plethora of yarns available at your local yarn shops and online within your own country and around the world. Yarns come in different weights (ply), colours, textures and combinations. Most knitters have more yarn than they’ll ever be able to use in a their lifetime. This is known as a ‘stash’. Knitting Patterns – Similarly, there is an absolute plethora of knitting patterns available. More importantly, there are so many free knitting patterns available online. Three of my favourite online sources are Ravelry, Knitting Pattern Central and the Lion Brand Yarn websites. Knitting Books – Good knitting books in particular stitch dictionaries are a must. They cover the knitting basics with great colour illustrations. Two of my favourite online book stores are The Book Depository and Fishpond. Both offer free postage which is an added bonus. I get regular deliveries at home from my online book purchases! Here’s a great story from the blog Knitting to Stay Sane about the top knitting books you should have on your shelf. I have purchased a few of these and they are a worthwhile addition to any knitaholic’s library. In particular, I really love all the books written by Stephanie Pearl-McPhee aka The Yarn Harlot. If you love a good laugh, love reading about knitting and want to learn more about knitting, then I would encourage you to purchase and read her books. You won’t regret it! When you love reading as much as I do and love knitting as much as I do, well then a book about knitting is just heaven! Crochet Hooks – Knitters who don’t crochet seldom realise that a crochet hook can make their knitting much easier in many different ways. Listed below are just a few of the ways crochet hooks can make your knitting easier and faster. When the instructions say “make 1,” use your crochet hook to draw the new loop through under the bar and place it on the left hand needle. You will find that the stitch you are trying to create will be easier to pull up since it will not slip off the hook. Use a crochet hook to pick up stitches along the edge of a knitted piece. This is useful for picking up the stitches along a neckline in preparation for knitting a collar or turtleneck, or for picking up stitches for sleeves or knitted-in pockets. Use your crochet hook to pull up the required number of loops and place them on your knitting needle. If you accidentally drop a stitch as you are knitting and several rows unravel, you can use your crochet hook to pick up the stitches. By picking up knit stitches from the front of the work and purl stitches from the back, you can easily rebuild your pattern. You can also stitch your knitted garments together using a crochet hook to slip stitch the seams together. This method results in a neater appearance on both the inside and outside of the garment and the joining is far more even than seams made with a yarn needle. If you are adding a fringe to a scarf or afghan, a crochet hook provides an easy way to pull the cut yarn through the stitches before knotting. This method is much faster and easier than using a yarn needle to draw through the yarn, and you can adjust the ends of your yarn before completing the knot. This saves a great deal of time in trimming the fringe once you have finished. Use a crochet hook to create a finishing border for afghans, rugs, and other flat items. The border will enhance the appearance of your finished project, and will help the piece lay flat. If you don’t know how to crochet, all you need to do is to learn how to make a few simple stitches. You will find then that it is possible to create a very decorative edge for your finished piece, enhancing both its beauty and its value. Crochet hooks can also enhance and stabilise knitted buttonholes. Use a crochet hook and either matching or contrasting yarn to slip stitch around the buttonhole, working three stitches in each end. The buttonholes will lay flat and create a nice, finished look to your garment. Pick up a few crochet hooks and keep them with your knitting needles. Try some of the suggestions listed here, And if you’ve never crocheted before, by learning a few simple stitches you will find yourself adding crochet to your list of needlework skills. Row Counters – A row counter for hand knitting is a tally counter for counting rows worked, for counting stitch pattern repetitions, or for counting increases or decreases of the number of stitches in consecutive rows. Design variations include on-needle barrel-shaped counters for straight-needle work, stitch-marker counters for knitting on double-pointed and circular needles, complex counters which attempt to assist with decreases, increases and lacework, stand-alone hand-held counters in imitation of the hand-tally, pendant counters worn round the neck and online software for smart phones. Darning Needles – A darning needle is simply a really large big needle. It isn’t very sharp, and has an eye on it that is large enough to thread with yarn or embroidery floss. There are a few sizes of darning needle. Use a large one if you are repairing a sock that has been made with a thick yarn, like one that someone hand-knit for you, or comfy winter socks. For the thinner, store-bought socks (like those favourite argyles that you just can’t toss out) use a smaller needle. I love the Chibi needles as they come in a very handy container (see below – the green container). Pins – Generally used when blocking your knitting or for pinning pieces together in readiness to sew sides together, eg sweaters. Stitch Markers – Stitch markers are essential tools for knitters and crocheters alike. They can be used to mark a certain number of stitches, the beginning of a round, where to make a particular stitch, and more. Patterns often call for stitch markers with the abbreviations “pm” (place marker) and “sm” (slip marker). It’s important to note that there are essentially two categories of stitch markers: closed and open (also known as split-ring). Stitch Gauge Measures – To check the gauge of your knitted or crocheted fabric, use a tension gauge. Frequently measure the gauge as you knit or crochet to ensure consistency in your stitches. Unevenness will affect the size of the finished item. Lay your knitting or crochet work flat. Lay your gauge tool on top, somewhere in the middle of the swatch. Don’t press it down so vigorously that you distort the stitches. To count stitches per inch, count the number of stitches there are across the window. Don’t forget that you have to double the number of stitches to determine the number of stitches per 4 inches. To count your rows, line up the vertical part of the window against a row of stitches and count the rows of stitches. You also can use a tape measure or ruler to help you count the number of stitches per 4 inches. Whatever tool you use, be sure that your knitting or crochet is flat on a table and that the measuring device is lying parallel to your rows of stitches. For something that doesn’t need to fit exactly, like a scarf or a wrap, you don’t need to be nearly as fastidious when checking gauge measurements. If it looks good to you, you don’t need to worry about the numbers. Needle Size Measures – A needle size measure has holes that correspond to the sizes of some of the most common needles. To test a needle, slide it into one of the holes. Keep trying until you find the one that it can just fit through without any (or much) wiggle room. That’s what size your needle is. Stitch Holders – Stitch holders are tools that are used by knitters to hold open stitches when not being used by the needles. They can be used when finishing a side of an item, such as a sweater, and preparing for the Kitchener stitch. They can be used on stitches separated from the needle when splitting the piece. For example, when shaping the neck hole of a sweater, the stitch holder is placed on the group of stitches used to make the neck hole, and the needles are used to continue to make the stitches on either side. Stitch holders are also used at the ends of sleeves of a sweater before they are attached to the body of the sweater. Scissors/Snips – I tend to use snips rather than scissors as snips usually come with a cover over the tips which is very handy as it will avoid any accidental snipping of your yarn which is the last thing you want. I have a couple of pairs of snips as I usually have more than one project on the go so I make sure I have snips (plus other accessories) in each of my knitting caddies. Notebooks – A knitting notebook is invaluable to keep a tally of the rows you’ve knitted (if you’d rather not use a row counter), variations you’ve made to a pattern, comments on a particular yarn……in fact anyting you want to record about a knitting project so that if you knit another item from the same pattern you’ll know exactly what small changes you made. You could also paste the ball band of the yarn and a sample of the yarn beside the pattern notations. These notebooks will become an important part of your knitting paraphernalia. I purchase all my knitting notebooks from my twice-yearly Lifeline Bookfests (the largest second hand book sale in the world!). They always have a stationery section with heaps of different bits and pieces……most of it new. The notebooks in the picture below on the left hand side are just a few of those I have purchased from between 50c – $1. You won’t get better value than that!. The picture on the right hand side (below) shows my calculations and row counts for one of my many pairs of socks. Pencils/Erasers – I only use a pencil so that I can erase any errors….plus pencils generally don’t leave any marks on yarn whereas pens always have the potential to leak. A nice soft eraser is a must so that it doesn’t smudge your page. I prefer 2B pencil lead as it’s nice and soft and dark. Document Holders – I recently knitted a pair of socks that had a 16 row pattern repeat which made it quite it difficult to keep my eyes on the correct row. I recalled that I had an old document holder in the cupboard which, over the years, I’d been toying with the idea of getting rid of it. I am so glad that I didn’t as the document holder was perfect to keep track of each row of the pattern. It even has a magnet to hold the top of the pattern in place. This came in very handy as I sat outside when I knitted this particular pair of socks and it was quite windy. The picture below is my document holder. It is just so incredibly handy and I’m so glad I still have it. It doesn’t need to lean against anything either as it has its own stand. 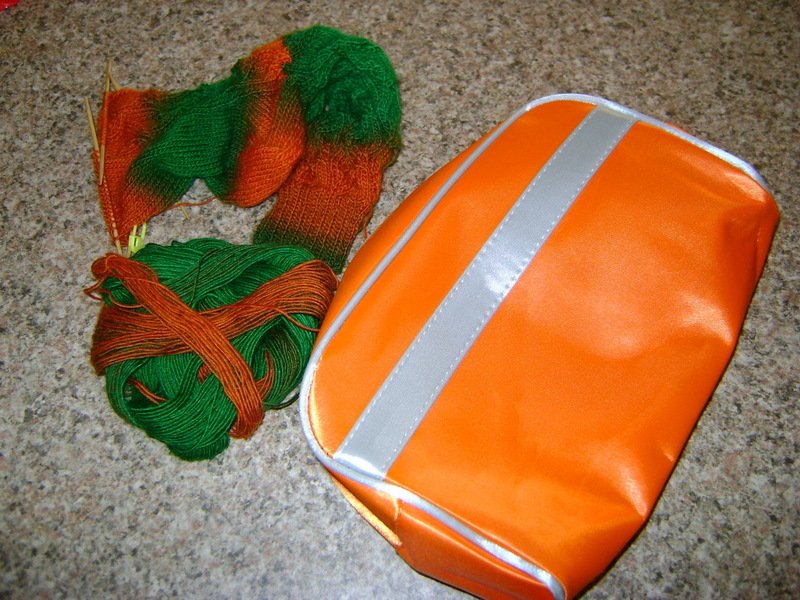 Knitting Caddies – A functional knitty caddy (or caddies) is so important. You need to be able to contain all of your knitting projects and accessories in the one caddy for easy transport from one room to the other. The pictures below are some of my knitting caddies. These days I tend to look at any container as a potential knitting caddy. I bought the orange zipper bag at Crazy Clark’s for only $3. It’s actually a toiletries bag but I’ve been using it for my sock knitting caddy. It holds my yarn, dpns, retractable tape measure, snips, darning needles, stitch markers, notebook, pencil and folded up knitting pattern. It’s so easy to grab and take with me when I’m on the go. It’s just a coincidence that the sock yarn matches it perfectly! The two knitting caddies below were purchased on ebay for about $11 each and I simply adore them. I have one upstairs and one downstairs. They each have multiple pockets on the inside and are well constructed. Unfortunately, this particular ebay seller doesn’t make them any more which is a shame because I’d like a couple more! I bought these two beautifully embroidered bags at the Redlands Spinners and Weavers open day in June last year. 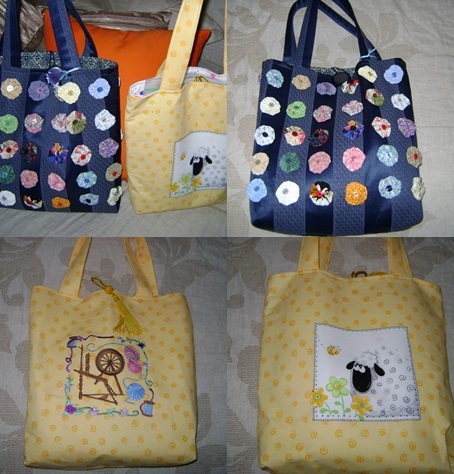 The yellow one has two gorgeous ‘knitterly’ pictures on the front and back of the bag. They are so beautiful and I use them as knitting caddies if I’m going to a coffee shop and taking either my knitting or crocheting with me. They hang neatly over the side of a chair or on one of those bag hooks that can be clipped to the top of a table. I bought this cute little vinyl bag at a ‘cheap’ shop for $13. I was immediately attracted to it because of its flat base. 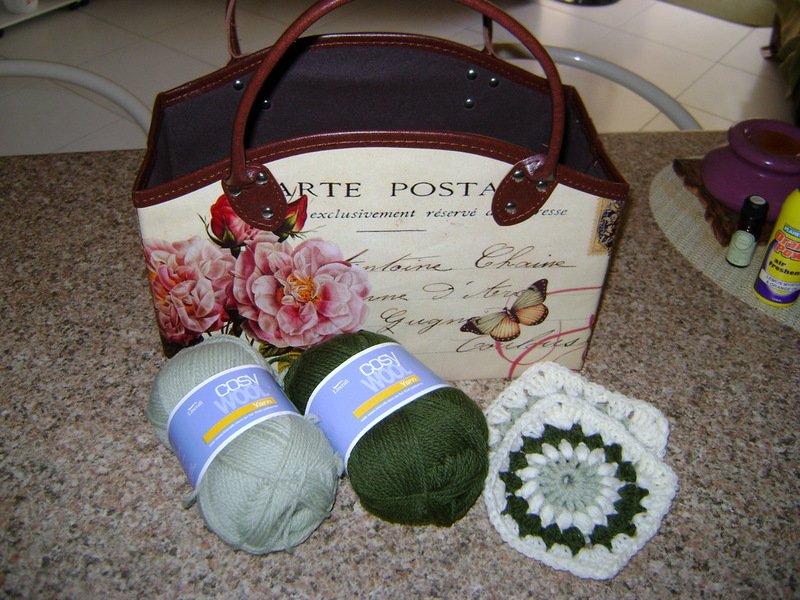 I currently have a crochet project on the go…..another starburst flower throw in two shades of green and cream. This project fits very neatly into my new caddy. 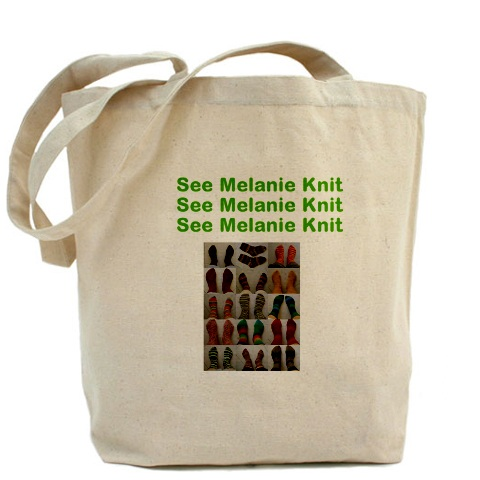 I have about four or five of these canvas knitting bags that I purchased from cafepress.com.au. You can also custom design them too which is what I did recently. This is my customised knitting bag. Don’t you just love it! That’s a picture of 15 different pairs of socks I’ve knitted. I manipulated the images with PhotoScape which is a fun and easy photo editing software that enables you to fix and enhance photos and does amazingly wonderful things with your photos. There’s also this adorable little case with a lovely French Toulouse Lautrec picture on it. I bought it from an interesting shop that sells all kinds of lovely gifts. I’ve been using it as another sock knitting caddy. As you can see my home is littered with stash and knitting caddies. I love them! And last but by no means least is my last piece of essential knitting paraphernalia. In fact it’s a must for those of you who are sock knitters. It’s my….. Foot Mannequin – This is a fantastic acquistion as it’s so easy to slip on a completed sock and pose the mannequin for lot of lovely sock pics. The mannequin also comes with a stand so it’s easy to store upright in a cupboard. It can be a bit difficult when you’re modelling the sock on your foot as well as being the photographer…this is where the foot mannequin comes in so handy! I hope you have enjoyed this foray into the world of knitting paraphernalia. I would love to hear from you about your important knitting essentials so I can add them to my list. Happy knitting, crocheting, spinning and yarning! Mel, It is a wonderful experience to view all the items I have seen you with over the past months all laid out for everyone else to see, I enjoy reading your blogs even though I get to catch up with you weekly. I think a book should be next on the list of things to do, what do the readers think ? Thanks for your kind words Helen. I quite enjoy writing my blogs and glad you enjoy them. The only book that would be on the horizon at this stage is my memoirs to leave to my son. Growing up overseas was so different to the upbringing he had in Australia so I think he would find it quite interesting to read to his children…..when he eventually has some. Hi Lana, I have to confess that the needles I use have mostly been purchased from ebay so I haven’t spent too much on them. As yet, I haven’t had any problems so will continue to use them. I particularly like bamboo needles as the stitches sit securely on the needles and don’t slide around as they do on metal needles; this is essential when knitting socks on dpns. I have just bought 13 sets of stainless steel circular needles from China on ebay. They haven’t arrived yet but I’ll be interested to see how good they are….only cost me $7. I have heard that Addi is a very good brand. I’d be interested to see how you go with your needles. Thanks for your question. Greatly enjoy your blog and the increadibly useful info. Where can one get the leg mannequin? I live in the US. Kathy E.
Hi Kathy, Thanks for the lovely feedback. 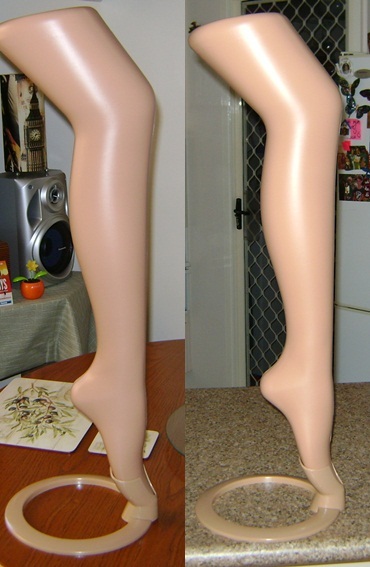 I bought my foot mannequin from the ebay Australian site so I am sure you should be able to acquire something similar in the US. Just enter the words ‘foot mannequin’ into the search engine of ebay and see what comes up. I always find that in the US you can purchase anything whereas here in Australia we are more limited by what is available so I’m sure you’ll be successful. Let me know how you go. I have just joined your group of followers and know I have found the RIGHT “woolaholics” to share and enjoy communicating with – and apart from that you are from Australia! O what a great day I am having. If only I can convince my husband that he needs to go out so that I can take-over the computer for the day and just savour all there is to read. Thank you so much for sharing your views, tips, hints etc. Hi Jenny, thanks so much for your kind words. Hope you enjoy my blog. Please leave comments, ask questions as I’m only to happy to answer. I was wondering if you could tell me where the kraft paper notebook with the illustration of the ball of yarn is from? It’s exactly what I am looking for! Sorry Lois, I have no idea where this notebook came from.